How did Shakespeare get inspired to write the classic Romeo and Juliet? Was there a secret, forbidden romance behind the story? As Shakespeare (Joseph Fiennes) struggles to put together a play, in the process selling it to both major theatres owned by Henslowe (Geoffrey Rush) and Burbage (Martin Clunes). With the Master of Revels (Simon Callow) shutting down the theatres the job becomes problematic, when Viola (Gwyneth Paltrow), a lady of court, decides to take up acting – forbidden for women – young Will’s job becomes illegal. The central premise is well played through and the two leads perform well – even if Gwyneth Paltrow is a tad hard to believe as a young man. This can be easily ignored and the rest of the film enjoyed. Paltrow and Joseph Fiennes play our own “star-crossed lovers” here and do so well. Fiennes in-particular finds a comedic slant for his character that enhances the role. It’s always a hard call to play The Bard but to do so surrounded by British acting royalty and some of the finest actors available? A marvellous turn by Judy Dench as HM Queen Elizabeth I steals any scene she’s in and that is just one minor role the leads are competing with. Tom Wilkinson and Geoffrey Rush are absolutely fantastic. Colin Firth, Jim Broadbent, Imelda Staunton, Ben Affleck, Mark Williams, Martin Clunes, Simon Callow, Nicholas la Provost – all draw you into an Elizabethan life long lost and yet apparently not too distant and alien from today. Two notable minor performances: Christopher Marlowe is played in a down beat fashion by Rupert Everett and John Webster is played by the young Joe Roberts. The latter is worryingly disconcerting for such a young actor. The sets and outside sequences are atmospheric of the period. Some long “runs” through old London are well constructed not allowing the movie to break out of character. The play that Shakespeare is writing through the movie evolves and changes in almost every aspect as the ‘real’ events churn and change around him. Nothing is fixed: title, theme, comedy or tragedy, character names, even – whether to have a dog! 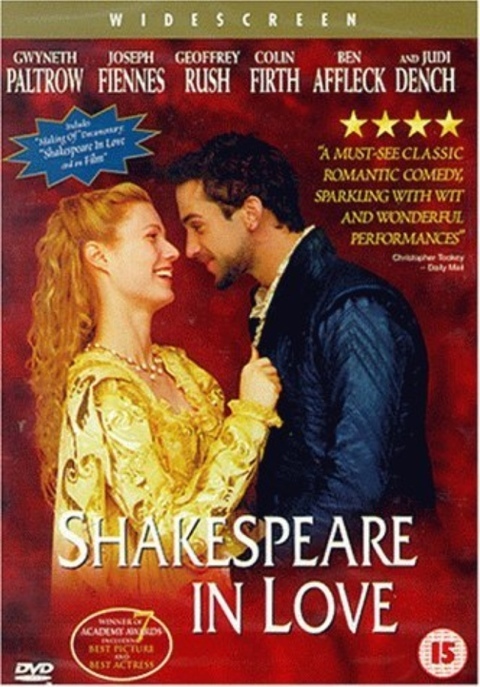 Nominated for 13 Academy Awards and winning 7 of them, including Best Picture, Best Actress and Best Supporting Actress (that tiny role by Judy Dench), Shakespeare in Love is an excellent date flick but transcends that monicker to become a pretty good movie in its own right. Those 13 nominations somehow excluded Joseph Fiennes‘ excellent performance, holding the movie together as England’s most celebrated play-write. Well done that man and ‘Boo! Hiss!‘ to the Academy.